Australian Indigenous Olympians recognised for Olympic DayThe spirit of the Olympic movement was alive and well today, as the Australian Olympic Committee hosted a ‘Reception for Indigenous Olympic Athlete Recognition’ at the National Centre of Indigenous Excellence. Kitty Chiller comments on 2015 benchmarksChef de Mission, Kitty Chiller speaks to media about the 2015 benchmark results. Olympic medals dumped in Melbourne rubbishA bronze Olympic medal worth thousands of dollars and other Olympic memorabilia have been found in rubbish outside a Melbourne home. 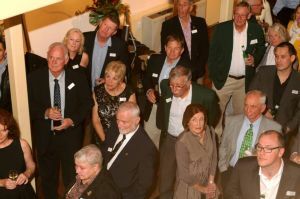 NSW Team Appeal DinnerTo mark one year to go to the Rio 2016 Olympic Games, the NSW State Olympic Committee held its Team Appeal dinner to raise funds to help send athletes to the Games. John Coates PavillionA pavilion at the Sydney International Regatta Centre in Penrith has been named in honour of AOC President, John Coates. Nova Peris' AGM SpeechNova Peris speaks about the AOC's decision to amend their constitution to include the recognition of Indigenous rights. Indigenous Olympians at AOC AGMIndigenous Olympians Des Abbott, Nova Peris and Baeden Choppy with AOC Secretary-General Fiona de Jong, Recognise Campaign Director Tanya Hosch and AOC President John Coates. Indigenous Recognition at AOC 2015 AGMOlympic gold medallist and Senator Nova Peris spoke to members of the Australian Olympic Committee AGM following the unanimous vote to change the constitution to recognise indigenous heritage. 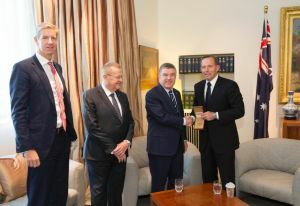 Tomkins Coates Bach AbbottIOC Member James Tomkins, AOC President John Coates, Federal Minister for Sport Sussan Ley and IOC President Thomas Bach at a meeting on 29 April 2015 at Parliament House in Canberra, Australia. 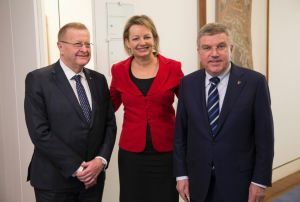 John Coates Sussan Ley and Thomas BachAOC President John Coates, Federal Minister for Sport Sussan Ley and IOC President Thomas Bach at a meeting on 29 April 2015 at Parliament House in Canberra, Australia. 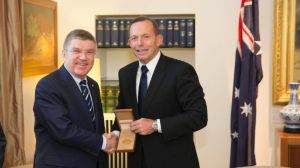 Thomas Bach and Tony AbbottIOC President Thomas Bach presents Australian Prime Minister Tony Abbott with a special Olympic medal for heads of state during a meeting at Parliament House in Canberra on 29 April 2015. 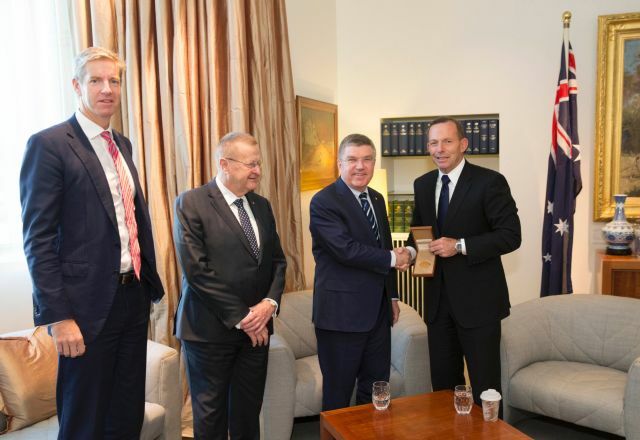 AOC backs possible South-East QLD Olympics bidAOC President John Coates speaks about a possible 2028 Olympic Games bid by South-East Queensland. Laurie Lawrence & James WillettLaurie Lawrence speaks to shooter, James Willet and his father at the Melbourne IGNITE session in Jan 2015. 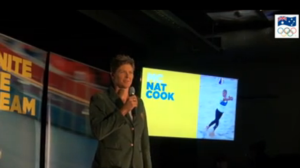 500 Days Press ConferenceWATCH Rio 2016 hopeful athletes and Chef de Mission Kitty Chiller talk about 500 days to go to the first South American Games. 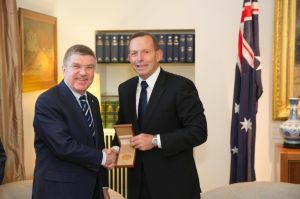 Coates and Freeman announce Indigenous initiativesThe AOC is changing its constitution to recognise our indigenous heritage, has updated one of the Team values and is putting more practical support behind the Cathy Freeman Foundation. AOC Ice Bucket ChallengeAustralian Olympic Committee staff take up the Ice Bucket Challenge in Sydney, Australia. The Premier's Launch of the Australian Olympic Team AppealThe Premier of New South Wales, The Hon. Mark Baird MP Launched the Australian Olympic Team Appeal in New South Wales at Parliament House. The Premier's Launch of the Australian Olympic Team Appeal (NSW)The Premier of New South Wales, The Hon. Mark Baird MP Launched the Australian Olympic Team Appeal in New South Wales at Parliament House.